Everyone wants a gorgeous tail in the show-ring. Once you get to the bigger stock-breed shows, tail extensions are common. Check with your association’s rules, however, before you spring for a tail extension. Arabians and Morgans, for example, must be shown with natural tails. Also consider that on some show circuits, like in local and 4-H competitions, a tail extension can look out of place. “Thirty years ago we shortened tails to the hock; now we want them down to the fetlock, and bigger is better,” says Barb Delf, owner of Custom Tails of Blue Grass, Iowa. In business since 1999, the company custom-manufactures tail extensions. To be sure the extension you order matches your horse’s natural tail, Delf recommends standing about 10 feet from your horse and matching the color you see. The outer tail hair will “veil” the extension when it’s attached. Expect to pay anywhere from about $85 to $500, depending on the color and weight of the extension. The most common colors (black, sorrel and chestnut) are less expensive than colors like gray, flaxen or white. Certain horses, such as Paints, have bi-color or tri-color tails, which require extensions with a mix of colors. You can specify either a blunt or natural-tapered end. Weighted tails were made legal for AQHA shows in 2012. Tail extensions and weighted tails can be used in any class except versatility ranch horse and ranch horse pleasure. Some companies, such as Custom Tails, have interchangeable weight systems, allowing you to use none, some or all of the weights, which come in 4-ounce increments. This is convenient because it lets you customize the weight and use the extension on more than one horse. Delf notes that the preferred weight of the extension varies according to discipline. 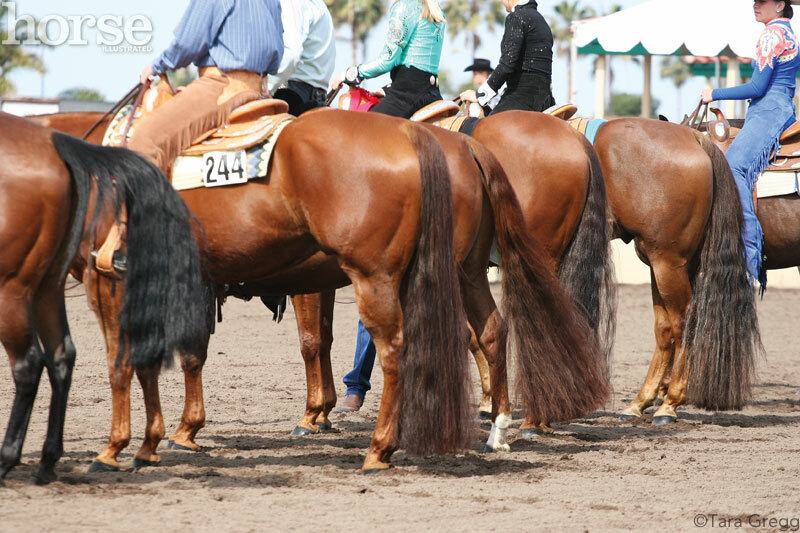 For example, heavy tails are typically used for western pleasure and hunt seat classes, while lighter tails are used for reiners, cutters, jumpers and barrel horses. For best results, follow the directions carefully. Where you position the extension will determine how long it hangs. You can braid it in anywhere from the lower third of the tail bone to all the way at the end of the bone. What about those obviously false tails at shows that get caught between the horses’ back legs? Delf explains that this can happen when a rider uses too thick of an extension for the horse. In that case, a lighter one may solve the problem. If the extension and/or the actual tail are dirty or tangled, the hair may get caught. Static electricity or rough chestnuts on the inner legs may also be to blame. Make sure chestnuts are smooth, and spray a silicone-based grooming product inside the horse’s hind legs. Tail extensions are intended for competition use only. Braid them in the morning of your show or event, and take them out once you’re done for the day. Leaving the extension in overnight is a big no-no. It could get caught on something or stepped on when your horse has been lying down and gets up. Either scenario can cause damage to the extension and/or your horse’s tail. 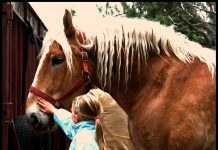 Since extensions are made of 100 percent real horse hair, you care for them just as you would your horse’s tail. “A clean, free-flowing tail will give you the prettiest look, so I suggest washing the extension after every day of showing,” says Delf. Let the tail extension air dry thoroughly before storing it in a protective hanging bag made specifically for this use. Look for one with a zipper guard to prevent hairs from getting caught and damaging the extension. CYNTHIA McFARLAND is an Ocala, Florida-based freelance writer and horse owner. The author of eight books, her latest is Cow-Horse Confidence: A Time-Honored Approach to Stockmanship, co-authored with Martin Black. This article originally appeared in the June 2014 issue of Horse Illustrated magazine. Click here to subscribe! Why can’t you just show your horse in its natural beauty? And I didn’t realize that the tail extensions come from slaughtered horses. That’s horrible. Horses should be shown as naturally as possible. That also goes for the stupid Western Pleasure headsets. You try walking that way! Why is it such a big deal if the tails come from slaughtered horses? When we hunt, we are encouraged to use as much of the animal as possible (we, personally, use every part except for the large/small intestine itself and its contents). Shouldn’t it be the same for animals slaughtered in slaughterhouses? I am all for regulations put into place that make it as quick and painless as possible, but I am not for getting rid of it completely. I would rather a horse be sent to slaughter than be left to starve to death. It makes me sad because I do love horses and have one of my own, but they are slaughtered and eaten just like cattle, pigs, chickens, etc. I love cattle too. They are sweet, funny, and lovely to be around, but they are a major food source. Humans are omnivores and this is our solution to being terrible hunters. They look tacky and just plain stupid on a stock horse. Stop trying to make them look like they stole the tails off of Gypsy Vanners! Totally ridiculous in my opinion. Horses look beautiful with their natural tails.